I’ve discovered my favorite herb to cook with is Thyme. It’s so versatile and it adds a delicious flavor to so many different dishes. I planted Thyme in my edible landscape several years ago. They grew into tiny bushes and I cooked with fresh Thyme often. But the drought took my plants so reluctantly I decided to buy jars of thyme for awhile instead. I was absolutely shocked when I saw the price of Thyme in the stores. Although you can buy a large container of cinnamon for .99 or less, Thyme was closer to $4 if it could even be found in our smaller rural stores! Last year I came across a small Thyme plant they were trying to get rid of at the end of the season. I grabbed it thinking maybe I could grow it in a kitchen windowsill. The Thyme grew scraggly in no time and I knew I was going to lose it. In desperation I pulled a single stem and stuck it in an outside cement planter on our south-facing porch and it thrived there all winter! Now finally it’s time to harvest and preserve some of it. I took out the kitchen shears and lopped off the stems leaving about 1/2 the height of the plant. I brought the stems in and after a quick rinse I started pulling off the leaves. I’ll keep the leaves in a bowl that I will leave on my kitchen counter. Each day I’ll fluff them to ensure even drying and they’ll be ready to store in about one to two weeks. After about thirty minutes of pulling leaves I decided that was too much of a labor-intense way to harvest them so I decided to dry the rest of the stems first then crush the leaves from the stems after all is dried. With my shock over the price of this precious herb the lesson has been learned! I’ll refill my old spice container with my own home-grown Thyme. Hopefully I’ll also be able to harvest and preserve more throughout the year as well as using it fresh. I’ll make sure I keep this herb container FULL! This entry was posted in Blog Posts and tagged Cooking, Food Preservation, Gardening, Make-It-Yourself on May 29, 2013 by Texas Homesteader. Wait, did I miss something? All you have to do to dry it is leave it out at room temp? That’s awesome! I had imagined it would have been way more complicated than that! I’m excited to try it out. Thanks for sharing this with us on Simply Natural Saturdays! 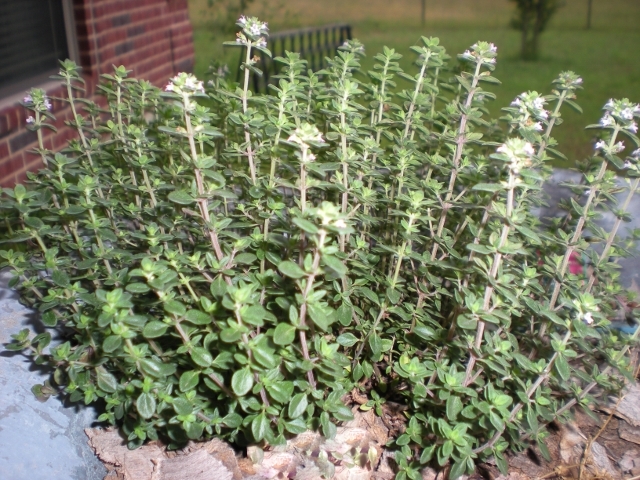 I want to start an herb garden – I did not even know there were different types of thyme. Thank you for this! I have been going through a lot of thyme. I bought a jar last week and my son dropped the grocery bag on the sidewalk on the way into the house. 🙁 I told him it was wasted thyme. Ha ha ha. Once I clear out my herb garden a little more I am going to plant some. Thanks for sharing at the Friday Follow Along. I never thought to wait until it was dry to get those tiny leaves off! That’s great that you managed to save it! I took pictures of the potted plants I planted on the weekend…. so I can remember what they look like while alive! I love cooking with Thyme and have started to grow my own. I’m going to try your technique for drying it! Thanks for sharing!! This is a great tutorial. Works for so many kinds of garden herbs! Thanks for posting to Green Living Thursdays at dudesustainable. Come back next week! I have difficulty maintaining a thyme plant indoors or out. They seem to dwindle away. Do you know which variety of thyme you have?